CORBA's ride and Pancake Breakfast September 28th. A National Monument? Just two weeks ago the public learned of a movement to have the San Gabriel Mountains declared a National Monument. The news came as a surprise, and we had little time to look deeper into what this meant. Last week’s public meeting did serve one purpose well, to get the discussion–and the emotions–going. The sudden announcement caught everyone’s attention, all the way up to the Undersecretary for the Department of Agriculture. This meant that it was happening quickly, and the process was already underway. It’s in all our best interest to be a part of that process, whether or not the final outcome is a new National Monument. Since last week’s public meeting, we’ve had time to begin a dialog with conservationists and other stakeholders and to do some research of our own. We now understand the Forest Service would continue to manage the land under a National Monument designation. 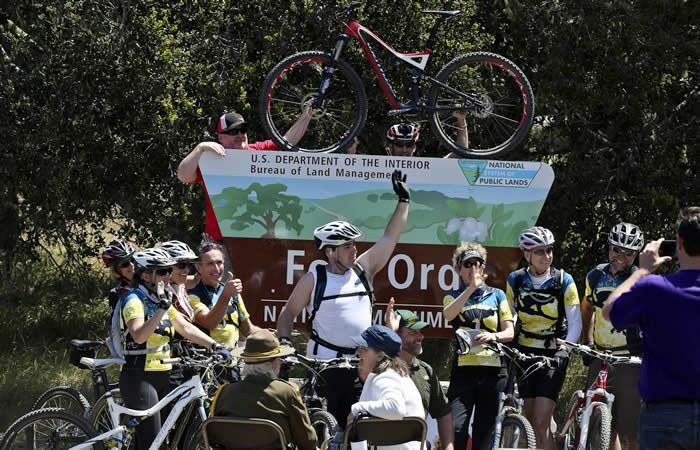 We learned that recently declared For Ord National Monument has language specifically mentioning bicyclists as legitimate trail users, and directs that bicycles are accommodated in a transportation/trail plan. This is an extremely positive precedent which encourages us. 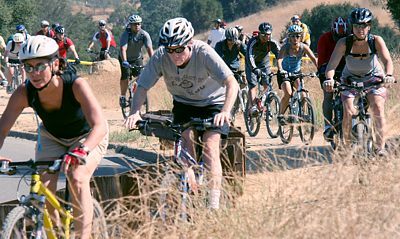 We’ve had several verbal assurances that mountain biking access would not be impacted, and that similar language could be developed for this proposal. 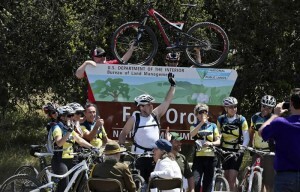 As we begin to be involved in the development of that language, we are working with our fellow chapters, IMBA staff, and other stakeholders to ensure our continued ability to ride mountain bikes on the trails and fire roads we love, and to improve overall conditions in the forest (through better protections and additional funding). A well-written National Monument proclamation and any additional funding it brings may be preferable to the Angeles NF continuing to be underfunded and understaffed, or even a wilderness bill that would close off access to trails. There are many competing interests for National Forest land. There are those interested in protecting it, developing it, and just recreating in it. The challenge will be to get the balance between those interests right. If a National Monument proclamation does move forward, as it appears to be, we need to be involved in its development and included in the outcome. In the meantime remember to make time to ride. Every time we do so we remind ourselves why our local mountains are important to us. They’re important enough to protect, and important enough to want to ensure that our grandkids can enjoy similar trail experiences, and similar ways to connect with nature. Come join us for a RAM (Ride and Mingle) morning! Ride beautiful Sycamore Canyon in Pt. 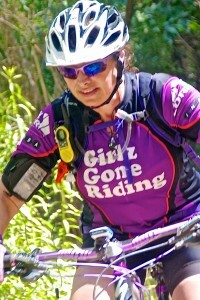 Mugu State Park with your buddies, or join one of the guided beginner, intermediate or advanced rides. 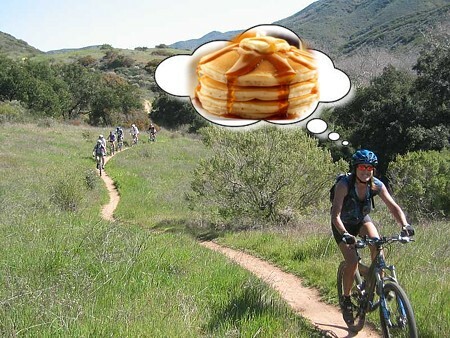 Then pop over to Michael’s Bicycles in Newbury Park at 10:30am for pancakes! Please sign up in advance so we’ll know how much batter to have on hand for hungry riders! You can sign up on the CORBA Meetup page or the CORBA Face Book page. 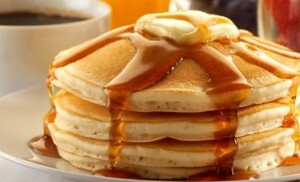 Suggested donation for the Pancake breakfast is $10. Directions to the trail head in Newbury Park: Take the 101 Freeway to the Wendy exit in Newbury Park. At the end of the off-ramp proceed south on Wendy until it dead-ends at Potrero Road. Park in the adjacent dirt parking area. On Monday, June 9, 2014, CORBA’s board of directors unanimously approved the addition of Wendy Engelberg to the board. We’re more than excited to have her “on board” (pun intended). As part of the thank-you for volunteers who help with maintaining our trails in good riding order, CORBA has been giving away mountain biking swag at the end of each event. To speed things up on trailwork days, and to allow some really great (ie, expensive!) prizes to be given away, we will instead have a drawing at the end of the year for all the volunteers who come out during that year. We have a Niner frame waiting for some lucky volunteer, plus other great prizes including grips and saddles from Ergon! In order to be eligible for the drawing, volunteers must register for events in advance on our Meetup group, show up at the event and sign the standard waiver form. At the end of the year, we’ll go back through all the Meetup events and count the number of times each volunteer helped out. Everyone will get one chance in the drawing for each time they participated. Now by helping to keep our trails in good shape, you will have the satisfaction of knowing that you’re giving back to the trails community, of contributing to the enjoyment that others have in our open spaces, and also having a chance at scoring a sweet ride from CORBA and Niner! Good luck and thanks for helping out! November 8, 2014: Backbone Trail. 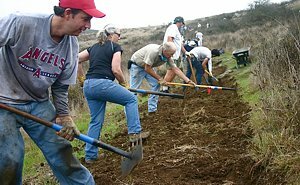 We'll be working on the Backbone Trail between Mulholland and Etz Meloy Fireroad, along with the crew from the Santa Monica Mountains Trails Council. Save the date; details will be forthcoming but online registration is available..
Girlz Gone Riding’s Rocktober XC Gala Registration is UP! We are almost at our cut off of 150 riders! Registration is cut off at 150 women so sign up now! Save the Dates for more GGR activities! Saturday September 6th is the next skills clinic.